We're excited to announce that our next live model for Empire's Comics Artist Meet-up is Demetra Wendy Manning. 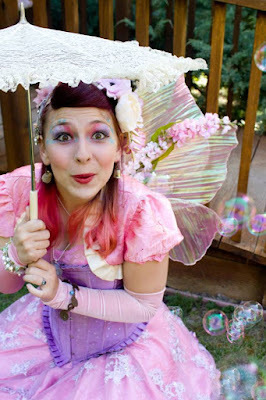 Demetra enjoys theatre, dress up, glitter, and the preciousness of snails, so it’s probably not surprising that she eventually became a Professional Faerie. Under the alter ego of ‘Wendy’, she can be found riding her dragon with trunks full of magic tricks, balloons, face paint, and presents for children all over northern California. Past modeling experience includes sculpture work and posing for painting. She’s a Taurus and a Hufflepuff, and you best believe her cookbooks are written in cover-to-cover.